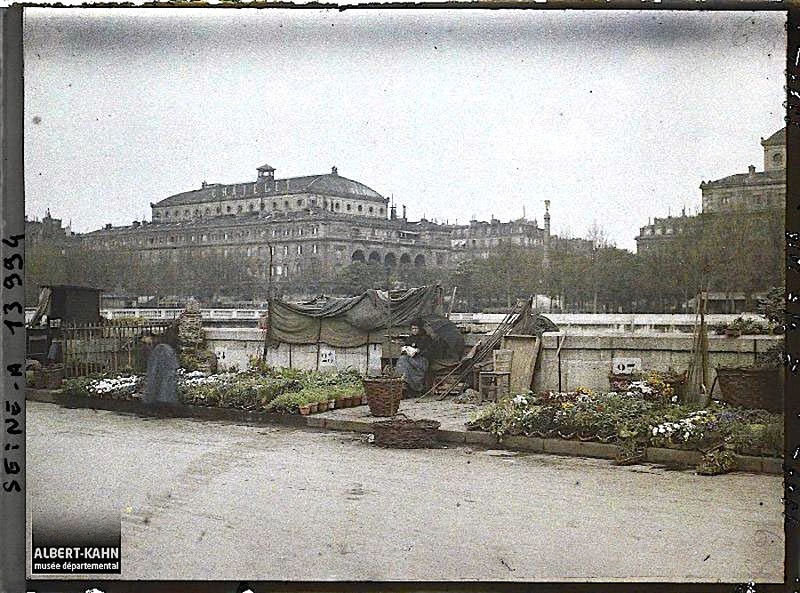 Flower sellers at Place Louis-Lépine on the l’île de la Cité, at Quai de la Corse, Paris, France, May 2, 1918, by Auguste Léon, via Archives of the Planet Collection – Albert Kahn Museum /Département des Hauts-de-Seine (both photos). There has been a flower market on or near this spot since 1808. Since June 2014, it has been called Queen Elizabeth II Flower Market, to commemorate the visit of the British queen just prior to the 70th anniversary of D-Day. Behind the sellers, on the other side of the river, is the Palmier Fountain and Châtelet Theater. Looking the other directions, with the Hotel de Ville in the background across the river. These autochromes are two of about seventy-two thousand that were commissioned and then archived by Albert Kahn, a wealthy French banker and pacifist, between 1909 and 1931. Kahn sent thirteen photographers and filmmakers to fifty countries “to fix, once and for all, aspects, practices, and modes of human activity whose fatal disappearance is no longer ‘a matter of time. '”* The resulting collection is called Archives de la Planète and now resides in its own museum at Kahn’s old suburban estate at Boulogne-Billancourt, just west of Paris. Since June 2016, the archive has also been available for viewing online here. *words of Albert Kahn, 1912. Also, the above photos (A 13 994, A 14688) are © Collection Archives de la Planète – Musée Albert-Kahn and used under its terms, here. This is during WWI so it is interesting to think about where were they growing these flowers and who was buying them. This is not a scene I had ever imagined. I think there used to be a lot of small-scale flower growers in the Paris area. Musee Albert-Kahn has several autochromes of gardens around the old city walls. I need to post a few.